Water landings have the green light the Green Toys Seacopter is ready to accept any eco-friendly rescue mission! 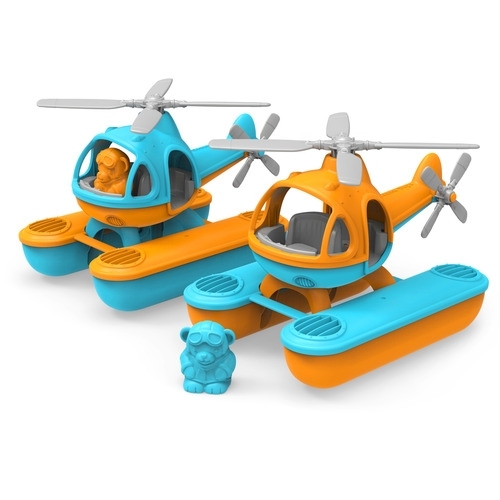 Specially designed with stabilizing, oversized fill-and-spill pontoons to keep it steadily afloat, this amphibious flier is perfect for water play whether in the bath or at the beach. Featuring a large top rotor and additional tail rotor, the Seacopter also includes a pilot bear figure for the open-design cockpit. The whole set is made in the USA from 100% recycled plastic milk jugs that save energy and reduce greenhouse gas emissions. No BPA, phthalates, or PVC. Dishwasher safe for easy cleaning. Packaged with recyclable materials and printed with soy ink.